Geo Cell is a 3D cellular confinement system. 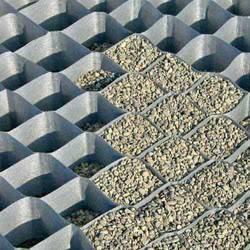 Manufactured from permeable geotextile fabric. 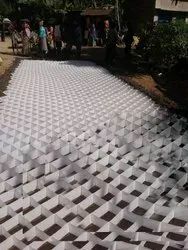 Geo Cell is expanded on-site to form a honeycomb-like structure which can be filled with sand, soil or other site material. This cost effective solution has multiple applications enabling reduced projects costs and lower environmental impact. 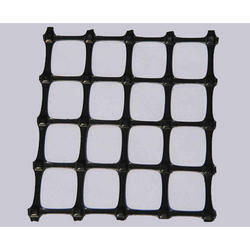 We are the leading manufacturer, exporter, importer, and supplier of supreme quality Erosion Control Geo Cells. The Geo Cells is designed to transfer the axle load laterally across to the tree root system, minimizing compaction beneath the traffic line.Its unique, lightweight, and flexible material adjusts to various surfaces for easier installation and will also resist any impact damage. You may use different infill materials such as soils and recycled materials such as sand, gravel, and pebbles to provide the reduction in waste and save on construction costs. It is an eco-friendly soil stabilization solution that mixes with the natural environment. It can be installed quickly and reduced constructions cost it allow infill to interlock with the cell walls. By reducing down slop sliding force in saturated solution it results in a more stable system. 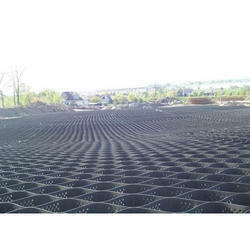 HDPE Texture Geocell Web with soil or concrete infilling provide an effective erosion protection system. Geocells filled with concrete can be shaped to form waterways to route storm water along slopes and embankments to prevent the formation of gullies and ruts which can weaken the earth structure. Geocells can be effectively used to foster vegetation along slopes, which would provide further erosion protection. Maintenance of paved and unpaved roads and highways has been a major issue for all road owner authorities. When the roads are not appropriately designed and constructed, a life of the roads drastically reduces causing disruption of the traffic. Such roads develop pot‐holes, develop uneven riding surfaces, and tend to settle over stretches, thereby disrupting traffic movement. Geocells in‐filled with sand/metal as subgrade improve the strength of the pavement, reducing settlements, a formation of reflective crack and pot‐holes. Besides, use of geocells not only reduces the thickness of the pavement section but also significantly reduces downtime due to maintenance. The HDPE Protection Geo Cell are manufactured from the range of permeable geotextiles that allow air and water to move freely across the root area from cell to cell. 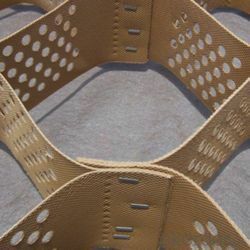 The Geocell's are supplied in the form of flat-packed panels which are expanded on site to form a much larger honeycomb area of interconnected cells. The panels are secured to the ground using steel pins which are also available to purchase. Access roads and parking areas. Geocells are strong, lightweight, three dimensional systems fabricated from ultrasonically‐welded High-Density Polyethylene (HDPE) strips that are expandable on‐site to form a honeycomb‐like structure. Ground Grid Geocells are filled with compact non‐cohesive soils which are confined within the cellular walls. The composite forms a rigid to semi‐rigid structure. The depth of the geocells as well as the size of each cellular unit can vary as per design requirements. HDPE Geo cell refers to Cellular Confinement System, which is a great erosion control system that confines the desired infill and resists downward migration of material due to hydraulic flows. 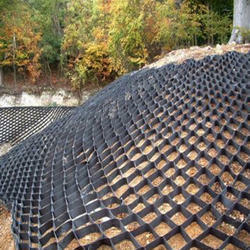 It is widely used for Slope Erosion Protection, earth protection, load support and channel protection.Due to its engineered, expandable, durable, high-density polyethylene honeycomb structure backed by high chemical and water resistant features, the Cellular Confinement System provides excellent protection for challenging slopes against erosion while ensuring Slope Stabilisation at all time. It ensures the long-term stability of slopes using concrete surfacing and vegetated topsoil. It is typically used for an application that includes road and railway embankment channel structures fill slop and stabilization. 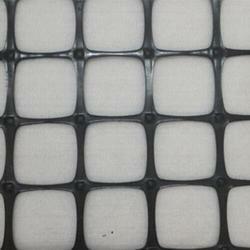 We are offering LDPE Geo Cell Sheet that is used in various engineering thermoplastics industries. The offered range of films is processed using premium quality low-density polyethene in accordance with the international standards. In addition to this, these films are available in different sizes and lengths. Our films are used for protection of food grains and fertilizers. In accordance with the diverse demands of clients, these films can be customized. 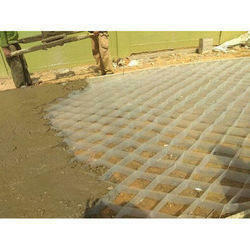 Impermeable flexible liner and are resistant to the ground water source from being. Contaminated by the toxic leachate produced by water percolation through Solid waste. Liquid waste, impoundment cut off walls, Gypsum stack, fly ash, and Municipal waste and spill containment system etc. Ocean has developed a new technology for the construction of roads with flexible concrete at a cost lower than that of a black top road. 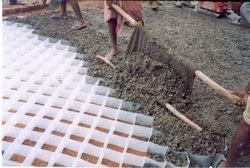 The method of construction makes the concrete flexible, and the surface does not crack. It is labour based, maintenance free and ideally suited for rural road construction as per the policy of the government where employment generation is very important for the empowerment of the poor. It requires less initial cost than the conventional pavement. It can also be used for overlays over damaged black top roads, pavements of footpath, roads of housing complex, container yards, haul roads for transport of mineral products, parking area of heavy vehicles etc. If the individual block fails then it can be easily replaced without much effort and with least cost. The cost of construction is considerably reduced when compare to conventional cement concrete pavement. 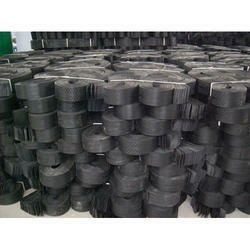 Due to high stiffness the over crust requirement gets reduced, hence economical for low volume of Roads. We are developed a new technology for the construction of roads with flexible concrete at a cost lower than that of a black top road. The expected life can be about 15-20 years. The method of construction makes the concrete flexible, and the surface does not crack. It is labour based, maintenance free and ideally suited to rural road construction as per the policy of the government where employment generation is very important for the empowerment of the poor. It requires less initial cost than the conventional pavement. The technology can also be used for overlays over damaged black top roads, pavements of footpath, roads of housing complex, container yards, haul roads for transport of mineral products, parking area of heavy vehicles etc.